Crutch Holder for Wheelchairs with push handles has straps that loop over the handles. The Crutch Holder for Wheelchairs or Scooters is a durable long bag with straps designed for carrying crutches for wheelchair and scooter users. 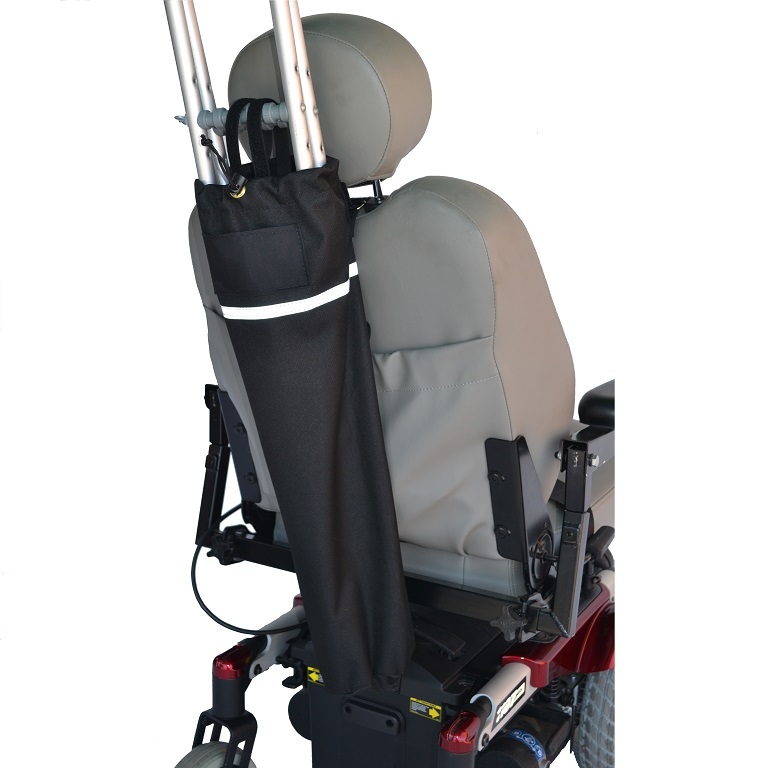 This crutch bag easily attaches to the back of wheelchairs and scooters with or without push handles. 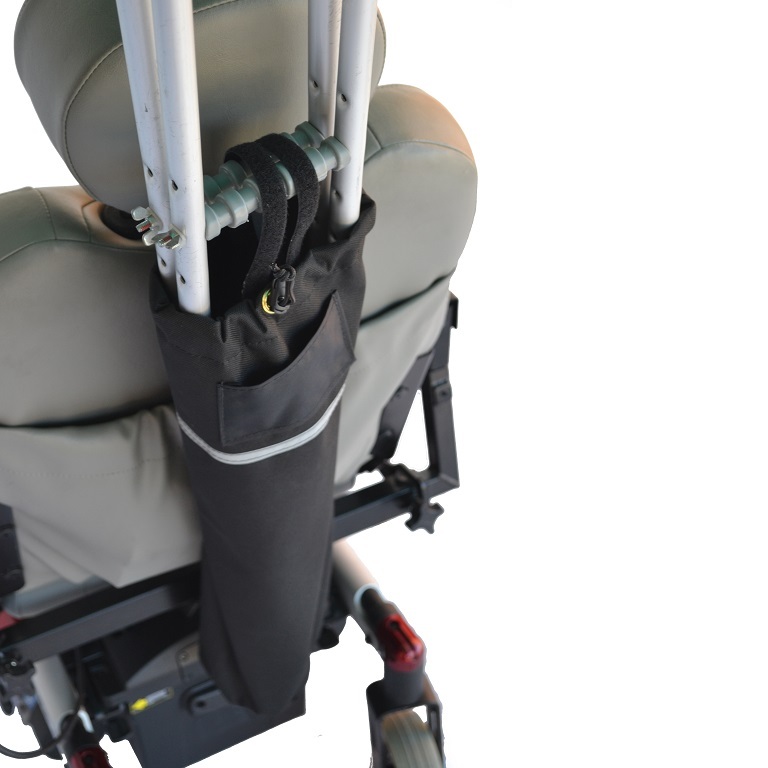 The Crutch Holder is made of high quality water resistant fabric, and is available with 2 different mounting systems. The Crutch Holder for Wheelchairs that have push handles includes straps that loop over the push handles. The Crutch Holder for Scooters without push handles includes a harness style strap that mounts over the back of the scooter seat. Inside the crutch carrier are hook-and-loop straps to secure both standard underarm crutches and forearm style crutches. 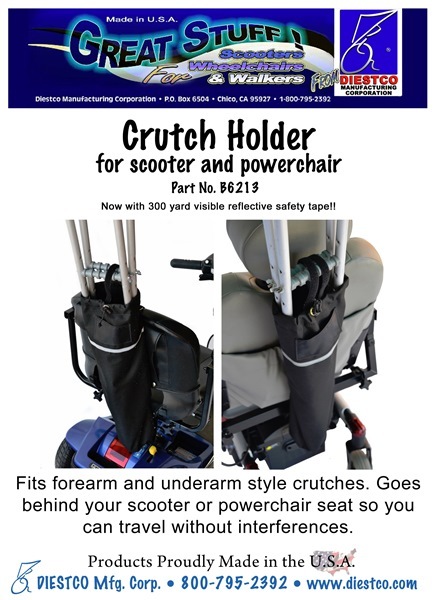 The Crutch Holder for Wheelchairs and Scooters is made in the USA. People with limited mobility who use a wheelchair or scooter for long distances, will find this crutch holder convenient for carrying their crutches with them for walking shorter distances. CDCB6313 Wheelchair Crutch Holder for chairs with push handles. Includes straps that loop over the push handles. CDCB6213 Scooter Crutch Holder for chairs without push handles. Includes a harness style strap that mounts over the back of the seat. Choose: Wheelchairs with push handles or scooter seat style. Material: Durable nylon water resistant fabric. Measures: 5 inches wide, 26 inches long. Holds: Standard underarm and forearm crutches. The crutch holder works perfectly for me. It was easy to attach to the chair, holds the crutches in place, and folds easily with the chair when I fold the chair for transportation. 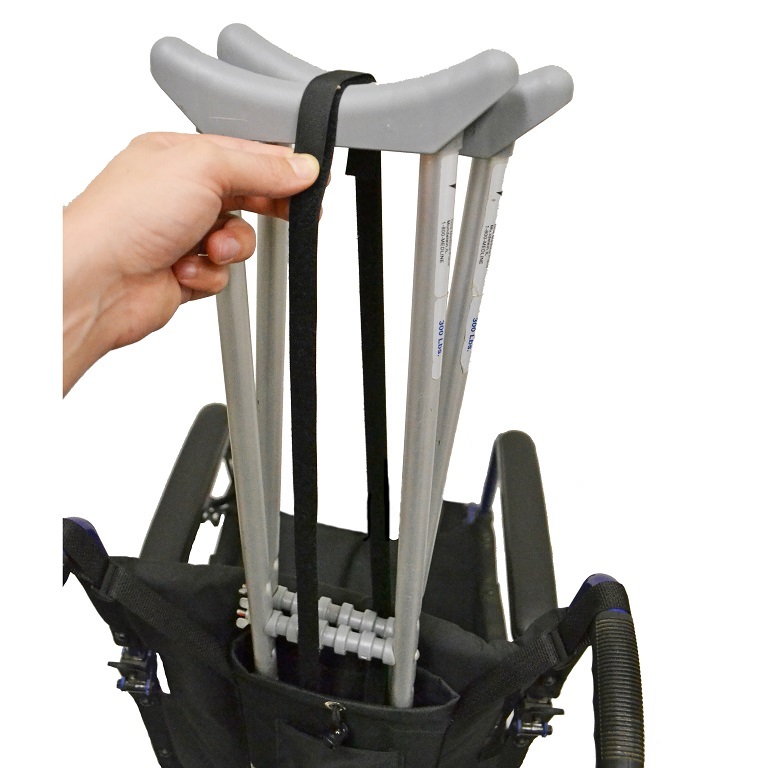 The straps at the top of the crutch holder are well-placed to help hold the crutches in place and the velcro is properly located to secure the straps. A good product. This works out great for my husband and I. He uses forearm crutches for short distances and likes having his crutches with him when we have to do the wheelchair. Does the trick. Just perfect for holding a cane. Love it. easy to put on scooter and to use. highly recommend. 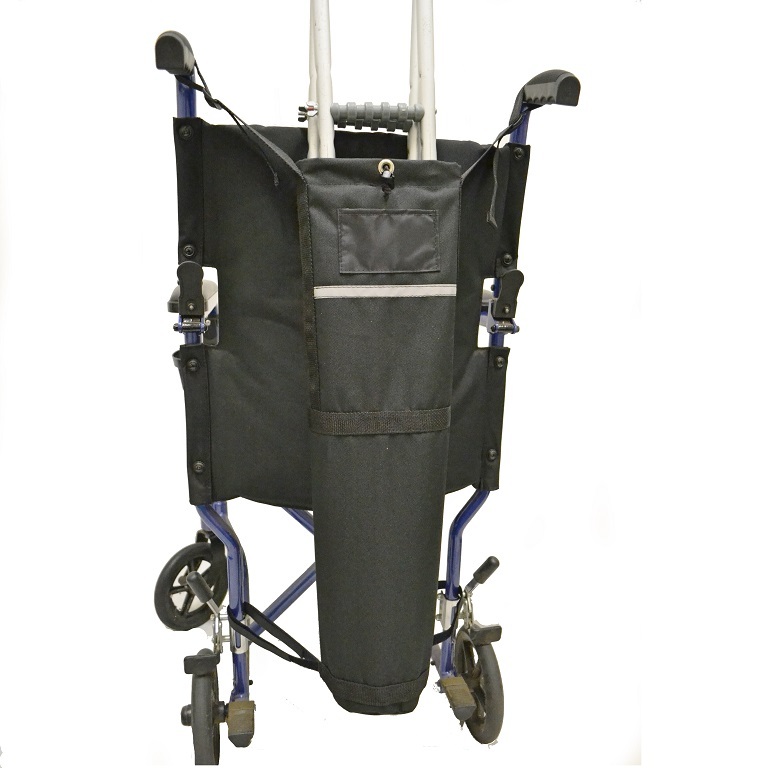 It works quite well and holds my crutches so I am able to wheel around more easily when I need to take them with me. I am only 5''4'''', but my crutches stick out quite a bit and, although they are stable, the stabilizing velcro straps do not reach over the crutches to help with that stabilization. Overall, very useful bag, don''t think there is much that could be done to improve it! Q: Would this work with forearm (Lofstrand-style) crutches or “SideStix”? A: Holds: Standard axillary and forearm crutches. Q: Dimensions of crutch holder please. I need a bag to carry my violin on my scooter! A: The Crutch Holder for Wheelchairs or Scooters measures: 5 inches wide, 26 inches long. I'm not sure a violin case would fit, the smaller end may but I wouldn't trust that to be secure enough.